Location/ Directions: I-75 Exit 82 (US Rt. 36 Piqua-Urbana). Northbound turn left off of exit then left at second light. Southbound turn right off of exit then left at first light. 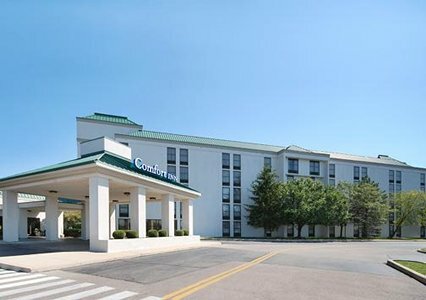 Hotel connected to mall next to interstate. About Hotel: 5-Floors, 124-Rooms, Interior Corridors,Free wireless high-speed Internet access, Food court, Free weekday newspaper, Indoor heated pool, Guest laundry facilities, Elevator, Bus Parking, Business Center, Convenience Store, Fitness Center, Indoor Whirlpool/Hot Tub, Outdoor Parking, Pet-friendly Hotel, Restaurant, Shopping, Free Hot Breakfast, Cable/Satellite TV, Free Local Calls, Hair Dryer, In-Room Coffee Maker, Individual A/C & Heat, Iron & Ironing Board, Voice Mail, Wake-Up Service, Wake-Up Service. Railroad View: Excellent View. Upper floor rooms on the front of the building provide a clear view of the railroad. Tracks are located across the mall parking lot. Railroads past Hotel: CSX Transportation. (Former Baltimore & Ohio, originally Cincinnati Hamilton & Dayton Railway). Photo Comment: The aerial photo shows the Comfort Inn near the top the photo (light colored building with green roof). The single track railroad can be seen along the bottom of the picture. Some trees planted along the motel may block the view from some rooms, but the rest of the rooms should be fine. We are not sure of the train frequency on this line.